Today I’ll be exploring the signature all-foam mattress from European bedding brand Emma. 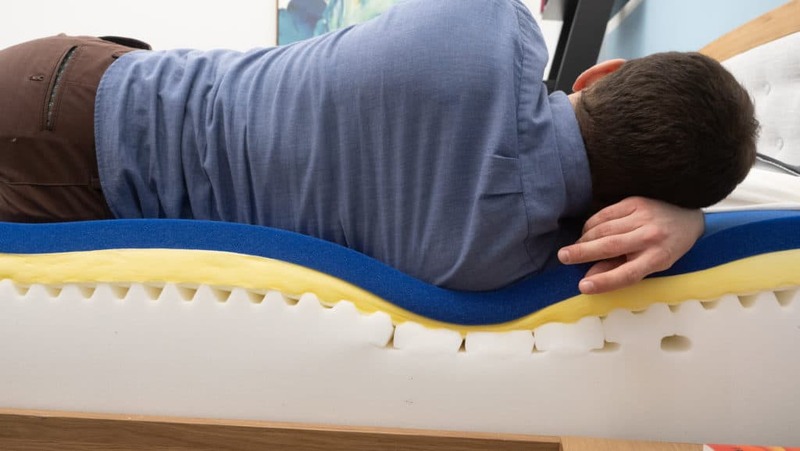 Designed by German engineers, this bed’s special combo of foams and nifty Zoned Support channels seem likely to provide an all-encompassing sleeping experience that’s both supportive and luxuriously soft. But is the Emma mattress really all it’s cracked up to be? I won’t know until I put it through my series of tried-and-true tests, which should not only tell me if this bed is worth the hype, but whether or not it could be the perfect bed for you! 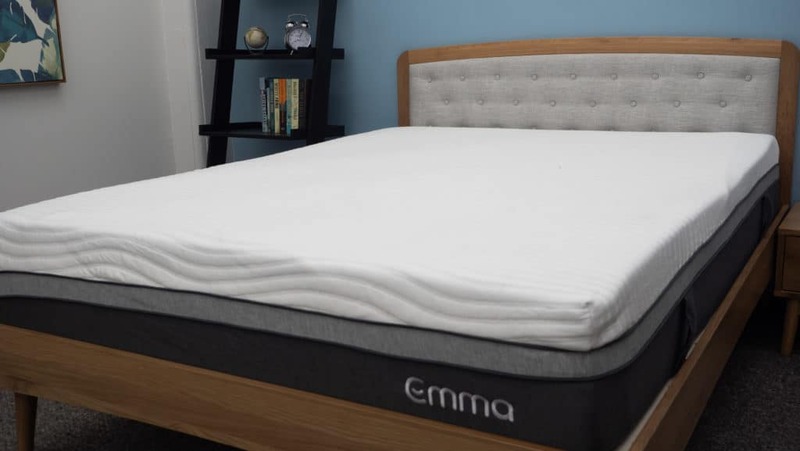 Emma sells an all-foam model as well as a hybrid mattress that features a pocketed coil system instead of the zoned foam. In this review, I’ll only be taking a look at the all-foam bed. Continue reading below for my full review of the Emma mattress. Don’t have time to read it all? No problem! Click here to skip to the bottom and check out my review summary. 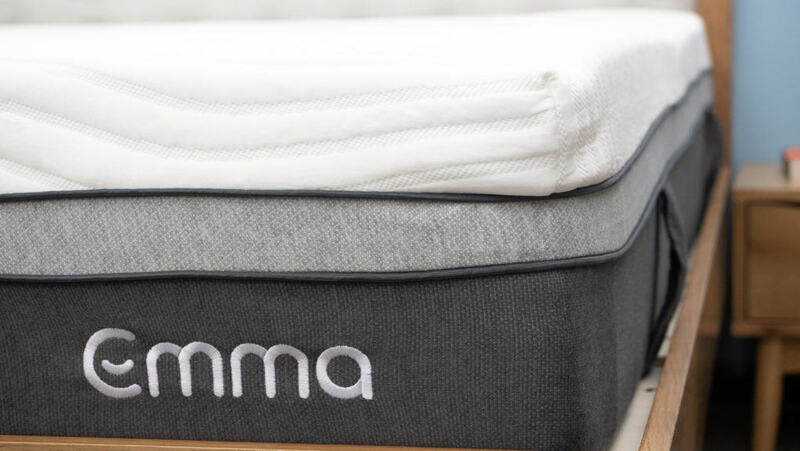 Emma is a popular European mattress retailer, founded in Germany in 2015. The company currently offers three models: the flagship Emma One, the three-foam-layer Emma Original and the premium Emma Air. Previously, these beds were only available in Europe. This launch marks their first stateside release. One of the brand’s defining features is a focus on spine support, regardless of sleeping position. The company boasts its mattress can find your optimal spinal alignment no matter what kind of sleeper you are. We’ll be putting this claim to the test later on in this review! The Emma all-foam mattress is built with three distinct layers of foam, measuring up to a height of 12 inches. The bed’s mix of Airgocell foam, memory foam, and dense polyfoam provide the sleeper with deep pressure relief, body-contouring and sinkage. Additionally, zoned support sections built into these foam layers help to balance all that softness with some necessary structure. To figure out what this bed is really all about, let’s take a closer look at these individual layers, one by one. Cover – The cover is constructed of a straightforward polyester blend, with the added perk of being removable and machine-washable. Polyester is often used in mattress covers thanks to its breathability and natural heat-dispersing properties, so Emma wisely chooses not to reinvent the wheel here. 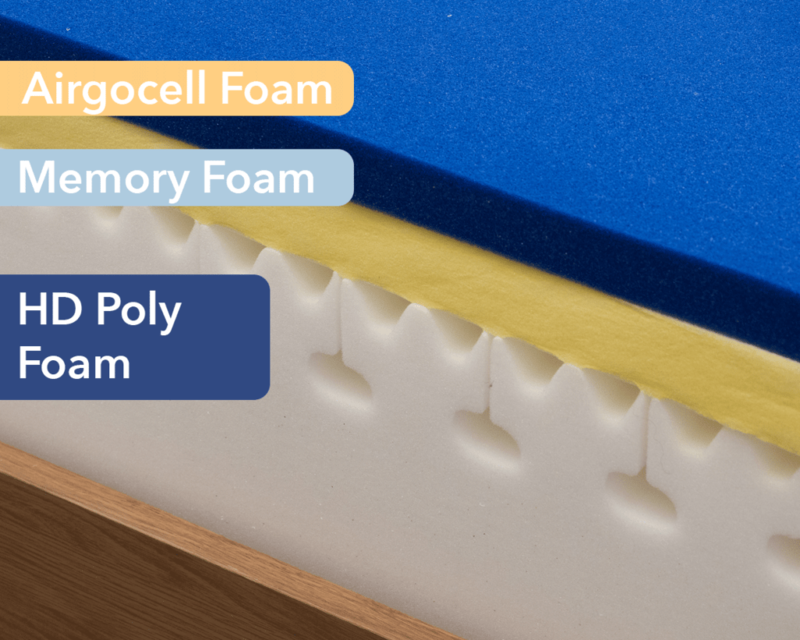 Comfort Layer – The top comfort layer is built with 1.5” of Airgocell foam, which responds quickly to pressure and should provide the sleeper with some immediate tension relief. This layer also encourages extra breathability and airflow, thanks to an open pore structure. Contour Layer – Moving down to the contour layer, you’ll find a cushy 2” of memory foam. A favorite among side sleepers thanks to its pressure-relieving softness, memory foam is famous for its sinkage and its slow response to movement (thus the name). Since the comfort layer is made of quick-responding Airgocell foam, and the contour layer directly beneath is made of slow-responding memory foam, these two layers in concert provide a contrasting balance that cradles the sleeper without restricting movement too much. Foundation Layer – The base in this mattress is a thick 8” section of high-density poly foam. As with the Comfort layer above, the sturdy and supportive material of this section helps to counteract that super-soft contouring layer of memory foam. The inclusion of zoned support channels offer a more comfortable sleeping experience, providing varying degrees of lift and cushion throughout the bed. After perusing the construction of the Emma mattress, let’s talk about its unique firmness and feel. I kicked things off by lying down on my back, and right away noticed the sensation of being cradled and contoured. I didn’t feel stuck, but I definitely felt the cushioning and sinkage of the bed’s memory foam layer. As I mentioned above, the Airgocell foam has a quick response to pressure, which no doubt went a long way to help me avoid feeling stuck in the bed. Thanks to that strong initial feeling of softness and contouring, I would say this bed ranks on the softer side of the firmness spectrum, so I gave it a 5/10. To get an even fuller picture of the Emma, I rounded up three other sleepers to help me test-drive the bed’s firmness and feel. They each gave the bed a personal rating and I assembled their ratings alongside my own on the graph below. Naturally, people of different body types and shapes will feel firmness differently, so you might not find the bed exactly as firm or as soft as we did; but hopefully our combined responses to the bed will give you a general idea of what kind of firmness to expect from this bed. As you can see from the graph, my testers were pretty much in consensus about the firmness of the Emma, giving it an average firmness rating of 5.4. Given that the industry standard for medium firmness is 6.5, the Emma is a soft bed, falling well below the threshold for medium-firm. While I did give this bed a 5 on the firmness scale, I found this bed’s combination of light, bouncy Airgocell foam and high-density polyfoam helped prevent the bed from feeling too soft. Memory foam layers sometimes run the risk of making the sleeper feel trapped by softness, but the Airgoell does a great job of mitigating that danger here. 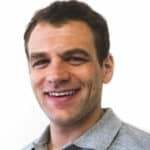 If you are an active sleeper and tend to move around throughout the night, you’ll probably want to know what your chances are of falling off the bed and ending up on the floor. To help you in this endeavor I tested out the Emma’s edge support. Lying on my back near the edge of the bed, I felt the mattress sloping down from the center under my bodyweight. This gave me a strong sense that the softness was carrying all the way from the center of the mattress to the edge. I found the edge of the bed in general collapses a bit too easily, which means this bed is likely not the best choice for those in need of a firm and structured mattress, nor for couples who share a bed. Something important to consider in any mattress purchase is how the bed responds to pressure points along the body. If you sleep on your side, for instance, you probably tend to feel pressure at the hips and elbows, so you’ll want to check out how the bed supports you and provides relief at those areas. Words alone can sometimes fall short in conveying the feel of a mattress, so I thought I’d make a handy visual aid to show where someone may feel pressure points form while lying on it. To do this, I placed a pressure map on top of the mattress and lied on my back, side, and stomach. You can see the results on the image below where pressure is represented from blue (low pressure) to red (high pressure). Back – I felt some fantastic contouring and sinkage in this position. The memory foam layer did a top-notch job of filling in the space at my lower back and the foam contouring helped to cushion my spine. This bed is super soft, but thankfully the Airgocell layer provided adequate bounce and support to keep me from feeling stuck or smothered in the bed. Side – Rolling onto my side, I felt pressure relief at my shoulders and hips, typical problem areas for side sleepers. The dense, cushiony memory foam layer cradled me along those pesky pressure points, while the zoned support channels in the support layer lifted up my hips and gave extra relief to my spine and shoulders. In general I felt quite cozy and comfortable in this position. This bed would be an excellent choice for side sleepers and anyone looking for help with spine support while they snooze. Stomach – Diving onto my stomach, I immediately felt my hips dip into the soft memory foam layer. The Airgocell layer seemed defeated by the pressure of the hips in prone position, and couldn’t provide quite as much bounce as it did when I was lying on my back. Stomach sleepers will likely find this bed too soft, as it places a little too much pressure on the hips. No review would be complete without a good old fashioned motion transfer test. While this test is useful for all sleepers, it’s especially applicable to those of you planning to share your bed with a partner, as it’ll give you an idea of how much you’ll be disturbed when they sneak out of bed to eat ice cream in the middle of the night, or fall back in bed like a ton of bricks. 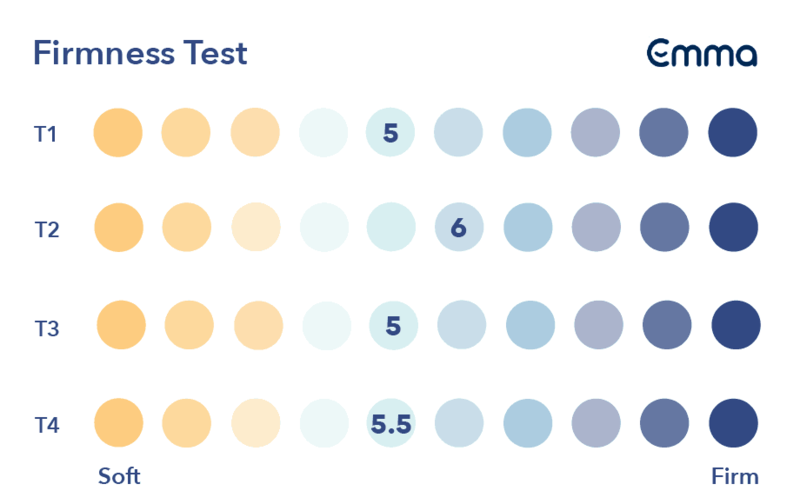 The results of this test showed that the Emma has fairly low motion transfer, which is great news for couples and dog-lovers. You’re not likely to feel normal movements and disturbances from across the bed, and even larger motions produced relatively minor spikes in our test. This means the Emma could be a great pick for lighter sleepers. When buying a new bed, most people want to know whether they’ll feel like they’re sinking “into” the mattress or laying “on top” of it. 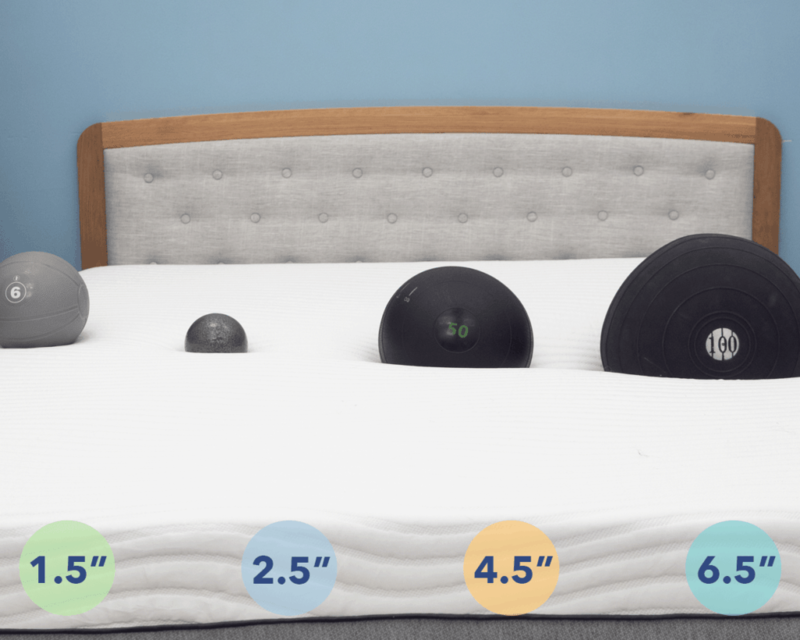 To test and demonstrate the sinkage of the Emma mattress, I placed four balls of varying sizes and densities (a 6 lb medicine ball, a 10 lb steel ball, a 50 lb medicine ball, and a 100 lb medicine ball) on the bed and measured how much they compressed the surface. What these results show me is that you’re going to experience some pretty serious sinkage with the Emma. This is more or less what you’d expect from the bed’s all-foam construction and memory foam comfort layer, and it’s definitely something to keep in mind if you like firmer support. You’ll probably feel more like you’re sleeping “in” this bed, rather than “on top” of it, despite its bouncy Airgocell foam. 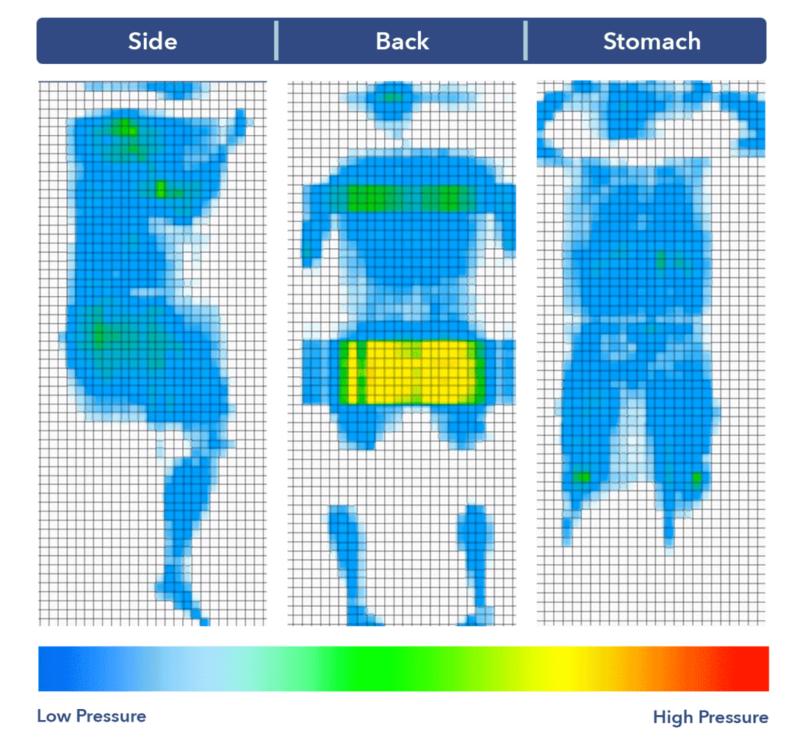 So while the intense pressure relief and body contouring will be great for side sleepers, stomach sleepers may want to go with a firmer model. 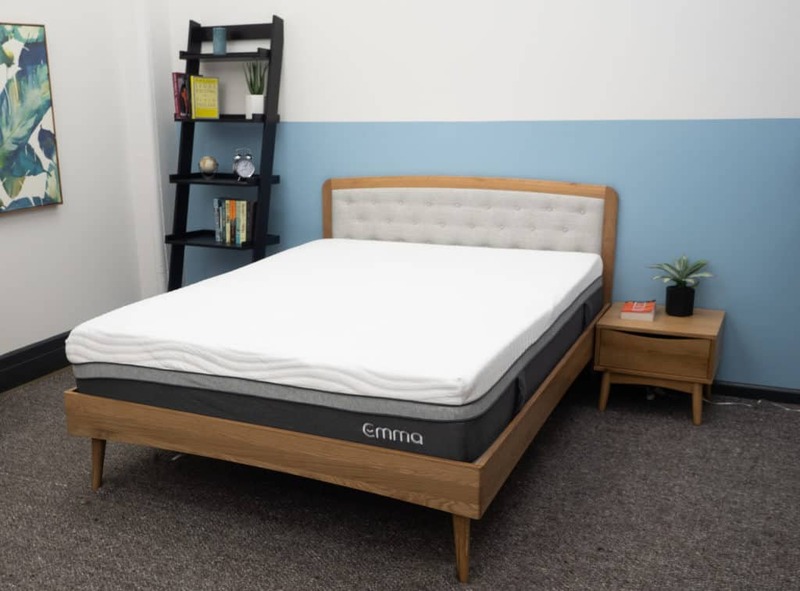 Now that we’ve fully explored the Emma mattress on a granular level, let’s break down the basic reasons this mattress would be an excellent fit for you. Pressure relief without feeling stuck – If you crave a soft, sinkable feeling but don’t want to feel smothered or stuck, the Emma won’t steer you wrong. It features great body contouring, soft sinkage and all the deep pressure relief you’ve come to expect from memory foam, while the Airgocell layer balances things out on top. Side sleepers – As I mentioned throughout the review, this mattress would probably be a perfect choice for side sleepers. This bed’s memory foam and Airgocell layers together make a dynamite combination of softness and support that will feel like a dream to side-sleepers. 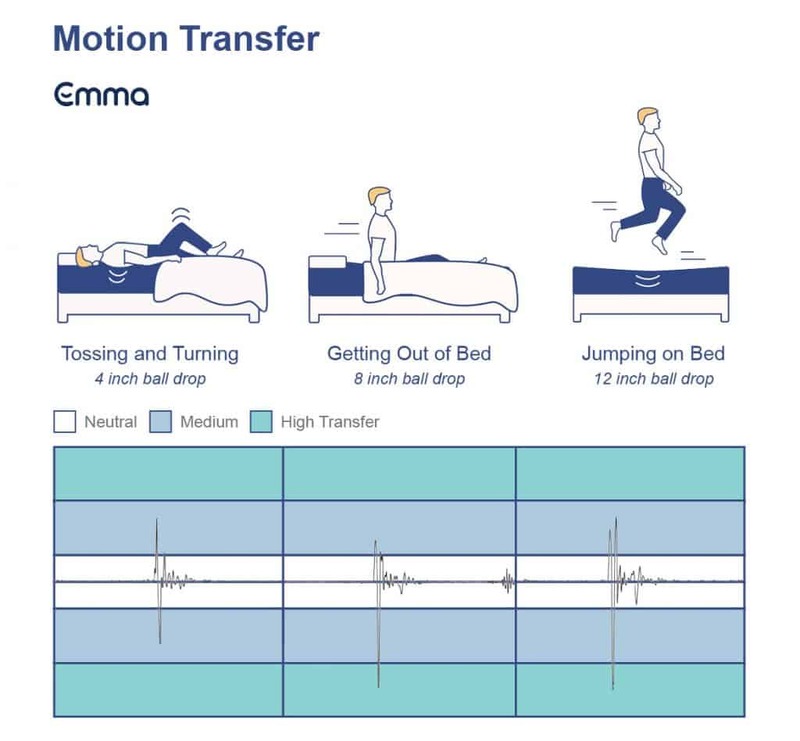 Low motion transfer – If you’re a modern day princess-and-the-pea, and you feel even small movements or disturbances from across the bed, the Emma’s low motion transfer would make this bed a solid choice for you. 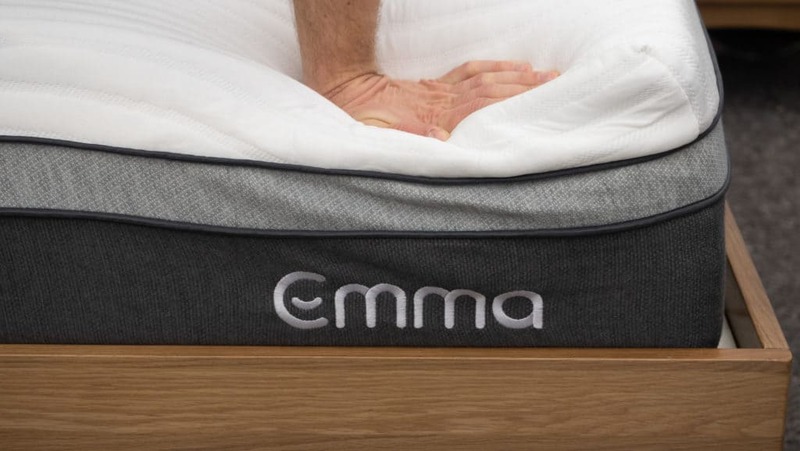 Not great for stomach sleepers – If you love to snooze on your stomach, the Emma mattress is probably not a good option for you. 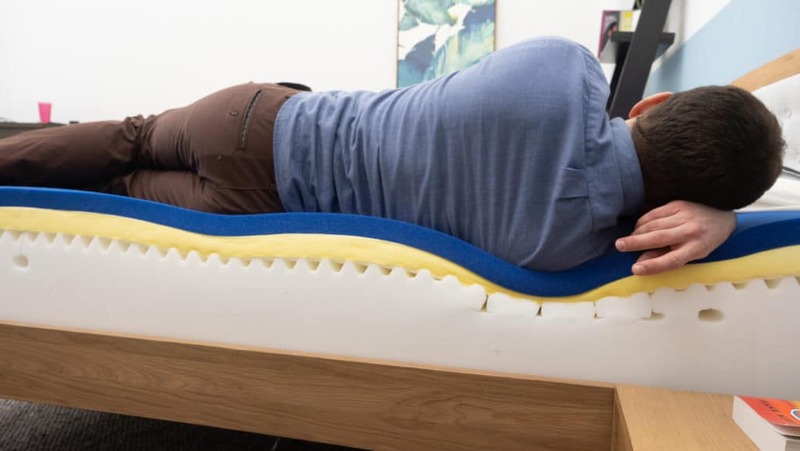 The bed’s soft and sinkable comfort layer does little to support the hips in the prone position, which means stomach sleepers are likely to feel tension and misalignment in the spine with this bed. Not recommended for heavier folks – The Emma’s cushiony layers lack the firmness and edge support that heavier folks might need to be comfortable through the night. Think the Emma might be just the mattress you’ve been looking for? Take a peek at the size and pricing information for the mattress in the table below.